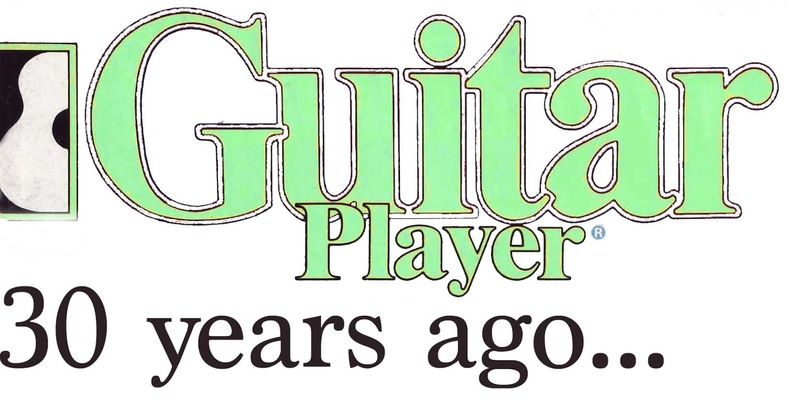 Welcome back to “30 Years Ago”, where I take a close look at the issue of Guitar Player magazine from exactly thirty years prior to discuss what I gleaned from the issue at the time and what I can learn from rereading so many decades later. I also provide a Spotify playlist that includes music that was mentioned in the month’s issue. September 1987 had a few highlights. The late Jerry Lewis’ annual telethon raised $39 million to fight muscular dystrophy; erstwhile presidential candidate Gary Hart admitted to cheating on his wife; while future President Donald Trump gained some attention by complaining about what he perceived as Japan’s unfair trading practices. Peter Gabriel took home Video of the Year in the MTV awards (his collaborator/guitarist David Rhodes is featured in the September 1987 Guitar Player); the United States celebrated the bicentennial of the Constitution; the NFL began a month-long players’ strike (pro footballers are only now beginning to unify again 30 years later against issues such as police brutality and Donald Trump). “Start Trek: The Next Generation” premiered on syndicated tv (30 years later, this month, a new Star Trek series is premiering in an online, streaming service). 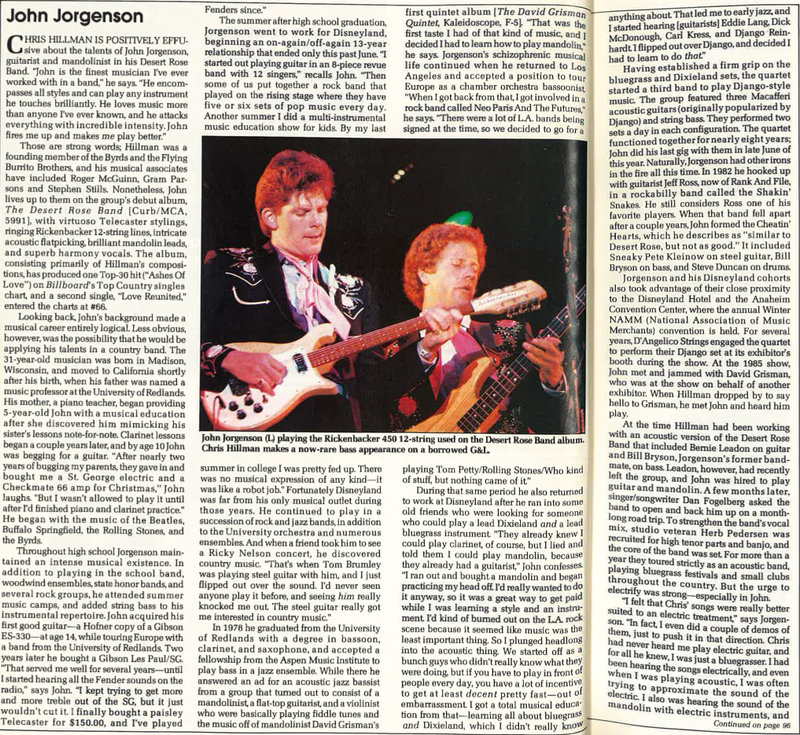 On the personal level, I began my senior year of high school that month and continued my lessons with fusion guitar player Jim McCarthy, whose hero (and teacher at G.I.T.) 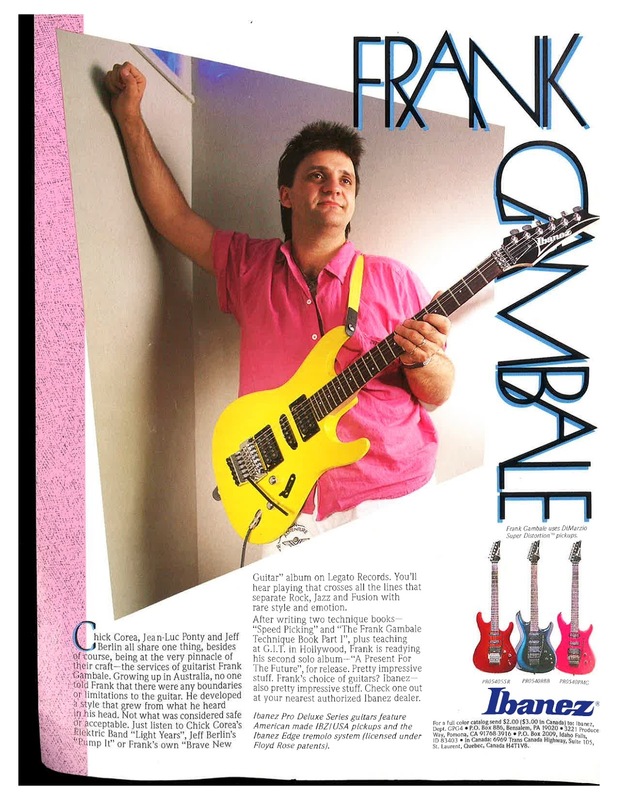 Frank Gambale was also featured in this month’s Guitar Player. If you remember the music of the 1980’s, several things were prevalent: hard rock; synthesizers; excessive over production of drums and guitars; and, most of all, speedy guitar playing. The 1980’s represented the rise of instrumental virtuosity as measured by notes per measure. 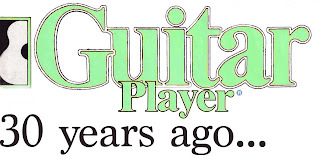 Where the 1960’s and 1970’s guitarists would sometimes play quite fast (think Alvin Lee or Neal Shon), in most cases they were still trying to play melodies that supported the song. 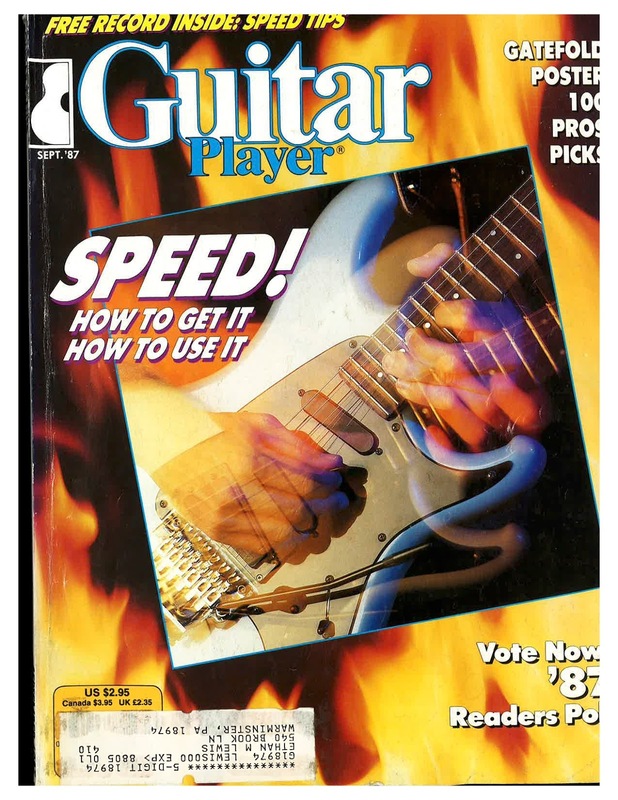 But in the 1980’s the growing tendency to “shred” led to faster and faster arpeggiated solos that often lacked any melodic or emotional content. But it sure was attention grabbing! Of course looking back now and seeing this era displaced by the grunge of the 1990’s to be replaced by the electronica of this century also lends a somewhat wistful air to the recollections of what might have been “peak rock guitar”. I think this is quite deep, and is both a good argument for building technical proficiency and musical fluency. I also take it as a rebuke to myself for not trying to at least maintain my ability to play fast, and will have to try to rectify that in my practicing. My memory of this issue is that it was all about speed, and that Frank Gambale was all over it. I was sort of right, as the “Thunder From Down Under” was part of the vinyl flexidisc soundpage, wrote an article about his system of “sweep picking” and was featured in an advertisement from Ibanez guitars. Sweep picking, by the way, is a system where instead of traditional alternate picking (up stroke, down stroke, upstroke, etc.) one minimizes pick movement by moving across the strings with similar strokes. A proficient sweeper (like my teacher) seems to hardly move the picking hand while the fretting hand appears to be working twice as fast. It sounds cool, and looks amazing. By the way: if you haven’t seen Frank play, you’re missing out. I saw him as part of Chick Corea’s Electrik Band in 1990 and it was literally the best concert I’ve ever attended. Check out this video to see what a band of virtuosi can do when they team up–it’s humbling for sure! The other articles this month were quite interesting. There was a factory tour of St. Louis Music’s Ampeg bass amp facility and a lengthy interview with eclectic musician Henry Kaiser (a member of GP’s advisory board who lived near the magazine’s Cupertino offices) that I doubt would ever be published today (though Premier Guitar has profiled other similarly obscure instrumentalists). But what really stands out to me is three profiles of musicians who were emblematic of what it means to be a real pro. The musicians were Billy Cox (who had played with Jimi Hendrix when they were both in the Army, and later was the bassist in Band of Gypsys), Brian Stoltz (who was then playing lead guitar for New Orleans legends the Neville Brothers, and John Jorgenson, who was playing lead guitar for The Desert Rose Band. Billy moved back to Nashville during the fall of ’70 and formed the short lived Nitro Function. “We put out a record,” he says, “but we didn’t have any control over it. That band had personality problems, business problems and everything else.” He then enrolled at Tennessee State University to study medicine. A year later, a call from his friend Charlie Daniels brought him back on the road…. The article understandably deals a lot with Cox’s recollections of Jimi Hendrix, but also asks about his bass gear and his then current record. As of this writing Cox is still alive and continues to tour with the Experience Hendrix shows. I thought it was very interesting to re-read this breakdown. For the last couple of years I’ve been fortunate to play (mainly for fun) with a rotating group of musicians here in Richmond, Virginia. What’s been great is to learn songs and continue to rehearse them, because the more of this I do the more I can identify with what Stoltz observed about the importance of rhythm in lots of rock contexts. What a dedicated person! I was a schoolteacher for 18 years and I knew lots of talented kids who played “in the school band, woodwind ensembles, state honor bands” and “attended summer music camps” but only a small percentage were able to become professionals. And how cool that he turned a degree in bassoon, clarinet and saxophone into a paying gig at Disneyland, which in turn gave him entree to the larger world of recordings. And the chutzpah for a reed player to fake his way into a gig as a mandolinist. Great story, and makes me want to listen to more of his playing. Finally, as you can see, the cover promised a centerfold poster of the plectra (picks) used by famous guitarists. I can’t show it to you, because it adorned my teenage bedroom wall and was thrown away decades ago. What I can show you, however, is my first ever guitar pick. I got this at my first lesson in 1986 and have kept it ever since. 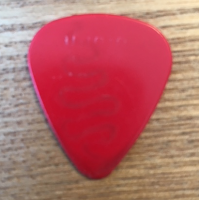 I don’t use it anymore (I prefer a bigger Fender 346 pick) but I still have it. I’ve been through a LOT of guitar gear in my time, but this little guy has always been close at hand. That’s it for this month. I’ll see you in October; in the meantime, keep on picking!